Adding sustainable office furniture to workspaces in and around the Toronto, Ontario, area, is becoming increasingly popular as more companies are choosing to be more environmentally responsible. Buying furnishings that are made of entirely new or unsustainable materials contributes to environmental issues like landfill waste and deforestation. To furnish your office with sustainable furnishings and join the growing eco-friendly movement, turn to Reusable Office Interiors. 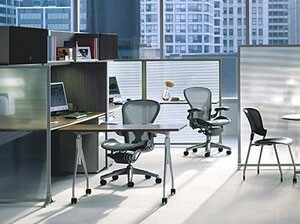 We can find you the perfect sustainable office furniture from top manufacturers like Haworth. The wide selection of gently used and refurbished pieces we offer are not only environmentally friendly, but also available at a great cost. Unlike brand-new furniture that is often incredibly expensive, the furnishings we provide are priced to fit a wide variety of budgets. While we are proud of the exceptional office furniture we sell, we are also delighted to offer our customers in the Toronto, ON, area, outstanding services to make updating their offices easier than ever. Our skilled and friendly technicians can deliver all of your new furnishings to your building and also set up all of the pieces, so that you can get back to work immediately. We also offer liquidation and recycling services, which effectively minimizes the amount of waste that ends up in landfills. In fact, recycling eligible items can even result in your company receiving a tax credit. Contact Reusable Office Interiors today to learn more about the benefits of adding sustainable office furniture to your workspace in the Toronto, ON, area.